Clovis (Latin: Chlodovechus; reconstructed Frankish: *Hlōdowig; c. 466 – 27 November 511) was the first king of the Franks to unite all of the Frankish tribes under one ruler, changing the form of leadership from a group of royal chieftains to rule by a single king and ensuring that the kingship was passed down to his heirs. He is considered to have been the founder of the Merovingian dynasty, which ruled the Frankish kingdom for the next two centuries. Clovis was the son of Childeric I, a Merovingian king of the Salian Franks, and Basina, a Thuringian princess. In 481, at the age of fifteen, Clovis succeeded his father. 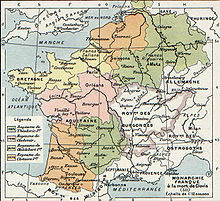 In what is now northern France, then northern Gaul, he took control of a rump state of the Western Roman Empire controlled by Syagrius at the Battle of Soissons (486), and by the time of his death in either 511 or 513, he had also conquered smaller Frankish kingdoms towards the northeast, the Alemanni to the east, and Visigothic kingdom of Aquitania to the south. Clovis is important in the historiography of France as "the first king of what would become France". Clovis is also significant due to his conversion to Catholicism in 496, largely at the behest of his wife, Clotilde, who would later be venerated as a saint for this act, celebrated today in both the Roman Catholic Church and Eastern Orthodox Church. Clovis was baptized on Christmas Day in 508. The adoption by Clovis of Catholicism (as opposed to the Arianism of most other Germanic tribes) led to widespread conversion among the Frankish peoples, to religious unification across what is now modern-day France, Belgium and Germany, and three centuries later to Charlemagne's alliance with the Bishop of Rome and in the middle of the 10th century under Otto I the Great to the consequent birth of the early Holy Roman Empire. His name is Germanic, composed of the elements hlod ("fame") and wig ("combat"), and is the origin of the later French given name Louis, borne by 18 kings of France. In Dutch, the most closely related modern language to Frankish, the name is currently rendered as Lodewijk, in Middle Dutch the form was Lodewijch. In modern German the name became Ludwig; in Spanish, Luis; in Italian, Luigi; and in English, Lewis. Numerous small Frankish petty kingdoms existed during the 5th century. The Salian Franks were the first known Frankish tribe that settled with official Roman permission within the empire, first in Batavia in the Rhine-Maas delta, and then in 375 in Toxandria, roughly the current province of North Brabant in the Netherlands and parts of neighbouring Belgian provinces of Antwerp and Limburg in current Belgium. This put them in the north part of the Roman civitas Tungrorum, with Romanized population still dominant south of the military highway Boulogne-Cologne. Later, Chlodio seems to have attacked westwards from this area to take control of the Roman populations in Tournai, then southwards to Artois, and Cambrai, eventually controlling an area stretching to the Somme river. 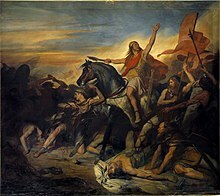 Childeric I, Clovis's father, was reputed to be a relative of Chlodio, and was known as the king of the Franks that fought as an army within northern Gaul. In 463 he fought in conjunction with Aegidius, the magister militum of northern Gaul, to defeat the Visigoths in Orléans. Childeric died in 481 and was buried in Tournai; Clovis succeeded him as king, aged just 15. Historians believe that Childeric and Clovis were both commanders of the Roman military in the Province of Belgica Secunda and were subordinate to the magister militum. The Franks of Tournai came to dominate their neighbours, initially aided by the association with Aegidius. The death of Flavius Aetius in 454 led to the decline of imperial power in the Gaul; leaving the Visigoths and the Burgundians compete for predominance in the area. The part of Gaul still under Roman control emerged as a kingdom under Syagrius, Aegidius' son. The ruler of Tournai died in 481 and was succeeded by his sixteen-year-old son, Clovis. His band of warriors probably numbered no more than half a thousand. In 486 he began his efforts to expand the realm by allying himself with his relative, Ragnachar, regulus of Cambrai and another Frankish regulus, Chalaric. Together the triumvirate marched against Syagrius and met the Gallo-Roman commander at Soissons. During the battle Chalaric betrayed his comrades for refusing to take part in the fighting. Despite the betrayal, the Franks landed a decisive victory, forcing Syagrius to flee to the court of Alaric II. The battle is considered be the end of Western Roman rule outside of Italy. Following the battle, Clovis invaded the traitor Chararic's territory and was able to imprison him and his son. Prior to the battle, Clovis did not enjoy the support of the Gallo-Roman clergy, hence he proceeded to pillage the Roman territory, including the churches. Quickly, the Bishop of Reims requested Clovis to return everything taken from the Church of Reims, the young king aspired to establish cordial relationships with the clergy and returned a valuable ewer taken from Reims. Despite his position, some Roman cities refused to yield to the Franks, namely Verdun‒which surrendered after a brief siege‒and Paris, which stubbornly resisted a few years, perhaps as many as five. He made Paris his capital and established an abbey dedicated to Saints Peter and Paul on the south bank of the Seine. Clovis came to the realisation that he wouldn't be able to rule Gaul without the help of the clergy and aimed to please the clergy by taking a Catholic wife. He also integrated many of Syagrius' units into his own army. The Roman kingdom was probably under Clovis' control by 491, because in the same year Clovis successfully moved against a small number of Thuringians in the eastern Gaul, near the Burgundian border. Around 493 AD, he secured an alliance with the Ostrogoths through the marriage of his sister Audofleda to their king, Theodoric the Great. In the same year, nearby King of the Burgundians was slain by his brother, Gundobad; bringing a civil turmoil to the kingdom. Gundobad proceeded to drown his sister-in-law and force his niece, Chrona to a convent, yet his other niece, Clotilde managed to flee to the court of her other uncle, Godegisel. Now, finding himself from a precarious position Godegisel decided to ally Clovis by marrying his exiled niece to the Frankish king. In 496 the Alamanni invaded, some Salians and Ripuarians reguli defected to their side. Clovis met his enemies near the strong fort of Tolbiac. During the fighting, the Franks suffered heavy losses and Clovis (+three thousand Frankish companions) might have converted to Christianity. With the help of the Ripuarian Franks he narrowly defeated the Alamanni in the Battle of Tolbiac in 496. Now Christian, Clovis confined his prisoners, Chararic and his son to a monastery. In 500 or 501 the relationship between the Burgundian brothers took the turn to the worse began scheming against his brother. He promised his brother-in-law territory and annual tribute for defeating his brother. He seduced his brother-in-law with the promises of territory and annual tribute for deposing his brother; Clovis was eager to subdue the political threat to his realm and crossed to the Burgundian territory. After hearing about the incident Gundobad moved against Clovis and called his brother. The three armies met near Dijon, where both the Franks and Godegisel's forces defeated the host of dumbfounded Gundobad, who was able to escape to Avignon. Clovis proceeded to follow to the Burgundian king and laid siege to the city, however, after some months he was convinced to abandon the siege and settled for an annual tributary from Gundobad. In 501, 502 or 503 Clovis led his troops to Armorica. He had previously restricted his operations to minor raids, yet, this time is the goal was subjugation. Clovis' failed to complete his objective via military means, therefore, he was constrained to statecraft, which proved fruitful for the Armonici shared Clovis' disdain for the Arian Visigoths. And thus Armorica and her fighters were integrated into Frankish realm. In 507 Clovis was allowed by the magnates of his realm to invade the remaining threat of the Kingdom of the Visigoths. King Alaric had previously tried to establish a cordial relationship with Clovis by serving him the head of exiled Syagrius on a silver plate in 486 or 487. However, Clovis was no longer able to resist the temptation to move against the Visigoths for many Catholics under Visigoth yoke were unhappy and implored Clovis to make a move. But just to be absolutely certain about retaining the loyalties of the Catholics under Visigoths, Clovis ordered his troops to omit raiding and plunder, for this was not a foreign invasion, but a liberation. Armonici assisted him in defeating the Visigothic kingdom of Toulouse in the Battle of Vouillé in 507, eliminating Visigothic power in Gaul. The battle added most of Aquitaine to Clovis's kingdom and resulted in the death of the Visigothic king Alaric II. According to Gregory of Tours, following the battle, the Byzantine Emperor Anastasius I granted Clovis the title of consul. Since Clovis's name does not appear in the consular lists, it is likely he was granted a suffect consulship. In 507, following Vouillé, Clovis heard about Chararic's plan to escape from his monastic prison and had him murdered. In 509, Clovis visited his old ally, Ragnachar in Cambrai. Following his conversion, many of his pagan retainers had defected to Ragnachar's side, making him a political threat. Ragnachar denied Clovis's entry, prompting Clovis to make a move against him. He bribed Ragnachar's retainers and soon, Ragnachar and his brother, Ricchar were captured and executed. Shortly before his death, Clovis called a synod of Gallic bishops to meet in Orléans to reform the Church and create a strong link between the Crown and the Catholic episcopate. 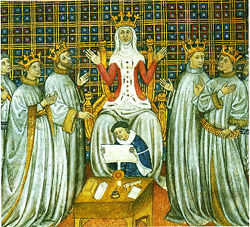 This was the First Council of Orléans. Thirty-three bishops assisted and passed 31 decrees on the duties and obligations of individuals, the right of sanctuary, and ecclesiastical discipline. These decrees, equally applicable to Franks and Romans, first established equality between conquerors and conquered. Clovis I is traditionally said to have died on 27 November 511; however, the Liber Pontificalis suggests that he was still alive in 513, so the date of his death is not known for certain. After his death, Clovis was laid to rest in the Abbey of St Genevieve in Paris. His remains were relocated to Saint Denis Basilica in the mid- to late-18th century. When Clovis died, his kingdom was partitioned among his four sons, Theuderic, Chlodomer, Childebert, and Clotaire. This partition created the new political units of the Kingdoms of Rheims, Orléans, Paris and Soissons, and inaugurated a tradition that would lead to disunity lasting until the end of the Merovingian dynasty in 751. The disunity continued under the Carolingians until, after a brief unity under Charlemagne, the Franks splintered into distinct spheres of cultural influence that coalesced around Eastern and Western centers of royal power. These later political, linguistic, and cultural entities became the Kingdom of France, the myriad German States, and the semi-autonomous kingdoms of Burgundy and Lotharingia. Clovis was born a pagan but later became interested in converting to Arian Christianity, whose followers believed that Jesus was a distinct and separate being from God the Father, both subordinate to and created by Him. This contrasted Nicene Christianity, whose followers believe that God the Father, Jesus, and the Holy Spirit are three persons of one being (consubstantiality). While the theology of the Arians was declared a heresy at the First Council of Nicea in 325, the missionary work of Bishop Ulfilas converted the pagan Goths to Arian Christianity in the 4th century. By the time of the ascension of Clovis, Gothic Arians dominated Christian Gaul, and Catholics were in the minority. Clovis's wife Clotilde, a Burgundian princess, was a Catholic despite the Arianism that surrounded her at court. Her persistence eventually persuaded Clovis to convert to Catholicism, which he initially resisted. Clotilde had wanted her son to be baptized, but Clovis refused, so she had the child baptized without Clovis's knowledge. Shortly after his baptism, their son died, which further strengthened Clovis's resistance to conversion. Clotilde also had their second son baptized without her husband's permission, and this son became ill and nearly died after his baptism. Clovis eventually converted to Catholicism following the Battle of Tolbiac on Christmas Day 508 in a small church in the vicinity of the subsequent Abbey of Saint-Remi in Reims; a statue of his baptism by Saint Remigius can still be seen there. The details of this event have been passed down by Gregory of Tours, who recorded them many years later in the 6th century. The king's Catholic baptism was of immense importance in the subsequent history of Western and Central Europe in general, as Clovis expanded his dominion over almost all of Gaul. Catholicism offered certain advantages to Clovis as he fought to distinguish his rule among many competing power centers in Western Europe. His conversion to the Roman Catholic form of Christianity served to set him apart from the other Germanic kings of his time, such as those of the Visigoths and the Vandals, who had converted from Germanic paganism to Arian Christianity. His embrace of the Roman Catholic faith may have also gained him the support of the Catholic Gallo-Roman aristocracy in his later campaign against the Visigoths, which drove them from southern Gaul in 507 and resulted in a great many of his people converting to Catholicism as well. On the other hand, Bernard Bachrach has argued that his conversion from Frankish paganism alienated many of the other Frankish sub-kings and weakened his military position over the next few years. In the interpretatio romana, Saint Gregory of Tours gave the Germanic gods that Clovis abandoned the names of roughly equivalent Roman gods, such as Jupiter and Mercury. William Daly, more directly assessing Clovis's allegedly barbaric and pagan origins, ignored the Gregory of Tours version and based his account on the scant earlier sources, a sixth-century "vita" of Saint Genevieve and letters to or concerning Clovis from bishops and Theodoric. Under Clovis, the first codification of the Salian Frank law took place. The Roman Law was written with the assistance of Gallo-Romans to reflect the Salic legal tradition and Christianity, while containing much from Roman tradition. The Roman Law lists various crimes as well as the fines associated with them. 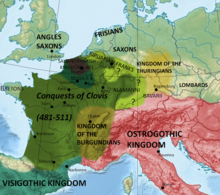 The legacy of Clovis's conquests, a Frankish kingdom that included most of Roman Gaul and parts of western Germany, survived long after his death. To the French people, he is the founder of France. Detracting, perhaps, from this legacy, is his aforementioned division of the state. This was done not along national or even largely geographical lines, but primarily to assure equal income amongst his sons after his death. While it may or may not have been his intention, this division was the cause of much internal discord in Gaul. This precedent led in the long run to the fall of his dynasty, for it was a pattern repeated in future reigns. Clovis did bequeath to his heirs the support of both people and Church such that, when the magnates were ready to do away with the royal house, the sanction of the Pope was sought first. By his conversion to Christianity he made himself the ally of the papacy and its protector as well as that of the people, who were mostly Catholics. Battle of Tolbiac. Fresco at the Panthéon (Paris) by Joseph Blanc, circa 1881.
c. 466: Clovis is born in Tournai. c. 467: Clovis' sister, Audofleda is born. c. 468: Clovis's sister, Lanthilde is born. c. 470: Clovis's sister Aboflede is born. c. 477: Clovis's mother, Basina dies. c. 481: Clovis's father, Childeric I dies and succeeded by Clovis. c. 486: Clovis defeats Syagrius in Soissons and begins the takeover of the kingdom. c. 487: Clovis' son Theuderic I is born. c. 491: Clovis completes the conquest of the kingdom and turns his attention elsewhere. Clovis marries Audofleda to Theoderic the Great. Clovis marries a Burgundian princess, Clotilde. c. 494: Clovis' and Clotilde's first child, Ingomer is born and dies. Clovis' and Clotilde's second son, Chlodomer is born. Clovis becomes an uncle as Audofleda gives birth to an Ostrogothic princess, Amalasuntha. Clovis is baptised (early estimate). Clovis defeats the Alamanni threat. Clovis' and Clotilde's third son, Childebert I is born. c. 497. Clovis' and Clotilde's fourth son, Chlothar I is born. Clovis' and Clotilde's only daughter, Clotilde is born. c. 501: Clovis' ally and brother-in-law, Godegisel is murdered. Clovis allies himself with the Armonici. c. 503: Clovis becomes a grandfather, when Theuderic secures a son of his own, Theudebert I.
c. 507: Clovis liberates Aquitainia and murders various Frankish reguli. c. 508: Clovis baptized by the Bishop of Reims (late estimate). Clovis executes the last pagan regulus. Clovis is declared the king of all the Franks. Chisholm, Hugh, ed. (1911). "Clovis" . Encyclopædia Britannica. 6 (11th ed.). Cambridge University Press. pp. 563–564. ^ Danuta, Shanzer (March 1998). "Dating the baptism of Clovis: the bishop of Vienne vs the bishop of Tours". Early Medieval Europe. 7 (1): 29–57. doi:10.1111/1468-0254.00017. ^ Meertens Instituut, Nederlandse Voornamenbank, Lodewijk. The second element corresponds to Middle High German wîc, with final-obstruent devoicing, as in Ludewic. The Middle Dutch form is wijch (modern Dutch wijg; see WNT, "wijg"), as in original Dutch Hadewig, Hadewijch. ^ Rosenwein, Barbara (2004). A Short History of the Middle Ages. Canada: University of Toronto Press. p. 43. ^ Bachrach, Bernard S. (1972). Merovingian Military Organization, 481-751. U of Minnesota Press. p. 4. ISBN 9780816657001. ^ Bachrach, Bernard S. (1972). Merovingian Military Organization, 481-751. U of Minnesota Press. p. 3. ISBN 9780816657001. ^ a b c d Bachrach, Bernard S. (1972). Merovingian Military Organization, 481-751. U of Minnesota Press. p. 4. ISBN 9780816657001. ^ a b Bachrach, Bernard S. (1972). Merovingian Military Organization, 481-751. U of Minnesota Press. p. 8. ISBN 9780816657001. ^ a b c d "Iron Age Braumeisters of the Teutonic Forests". BeerAdvocate. ^ The abbey was later renamed Sainte-Geneviève Abbey, in honor of the patron saint of Paris, and was demolished in 1802. All that remains is the "Tour Clovis", a Romanesque tower which now lies within the grounds of the Lycée Henri-IV, just east of The Panthéon, and the parish Saint-Étienne-du-Mont, which was built on the abbey territory. ^ Bachrach, Bernard S. (1972). Merovingian Military Organization, 481-751. U of Minnesota Press. p. 5. ISBN 9780816657001. ^ Bachrach, Bernard S. (1972). Merovingian Military Organization, 481-751. U of Minnesota Press. p. 6. ISBN 9780816657001. ^ Bachrach, Bernard S. (1972). Merovingian Military Organization, 481-751. U of Minnesota Press. p. 9. ISBN 9780816657001. ^ a b Bachrach, Bernard S. (1972). Merovingian Military Organization, 481-751. U of Minnesota Press. p. 11. ISBN 9780816657001. ^ Bachrach, Bernard S. (1972). Merovingian Military Organization, 481-751. U of Minnesota Press. p. 7. ISBN 9780816657001. ^ Ian Wood, The Merovingian Kingdoms, (Longman, 1994), 45. ^ Geary, Patrick (2003). Readings in Medieval History: Gregory of Tours History of the Franks. Canada: Broadview Press Ltd. pp. 145–146. ^ Danuta, Shanzer (March 1998). "Dating the Baptism of Clovis: The bishop of Vienna vs the bishop of Tours". Early Medieval Europe. 7 (1): 29–57. doi:10.1111/1468-0254.00017. ^ Robinson, J.H. (1905). Readings in European History. Boston. pp. 51–55. ^ Geary, Patrick (2003). Readings in Medieval History: Gregory of Tours History of the Franks. Canada: Broadview Press Ltd. p. 153. ^ Geary, Patrick (2003). Readings in Medieval History:Rome Law. Canada: Broadview Press Ltd. pp. 129–136. ^ "Clovis I | Biography, Significance, & Facts". Encyclopedia Britannica.